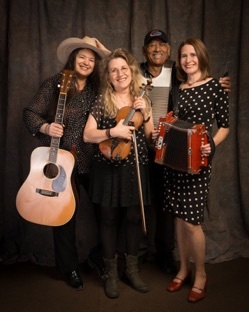 The California based all-women band is well known in the Cajun music scene for bringing the raw, driving authenticity of southwest Louisiana dancehalls to their shows. Popular zydeco musician and Louisiana native Andrew Carrière is a regular special guest and contributes Creole French vocals and some powerful accordion to the CD, as exemplified in the medley of tunes learned from his late father, legendary fiddler Bébé Carrière of the renowned Carrière Brothers from Lawtell, Louisiana. Andrew and many people from southwest Louisiana emigrated to California in the last half century and brought their music with them, inspiring a new generation of California musicians like fiddler Delilah Lee Lewis and accordionist Maureen Karpan to travel to Louisiana to learn to play the music. The Creole Belles’ self-titled CD on the Arhoolie record label, produced by Greg Landau and mastered by two-time Grammy winning engineer John Greenham, showcases the dynamic collaboration between Andrew’s soulful Creole roots and the Belles’ heartfelt expression of the music they have embraced over the years.